What do you intend to use your pergola for. Is it going to be for dining, your car, or for vine and growth support? If you are wanting to grow additional vegetation, you will want to think about how close together your rafters should be. What materials do you like? Would you prefer a natural wood or a sturdy metal? 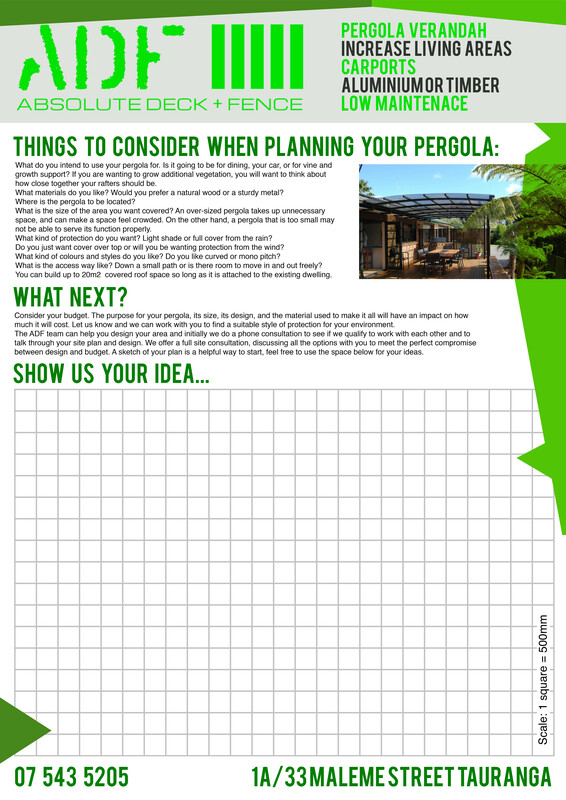 Where is the pergola to be located? over-sized pergola takes up unnecessary space, and can make a space feel crowded. On the other hand, a pergola that is too small may not be able to serve its function properly. Consider blocking light to your house. What kind of protection do you want? Light shade or full cover from the rain? Do you just want cover over top or will you be wanting protection from the wind? What kind of colours and styles do you like? Do you like curved or mono pitch? Clear, bronze, opal or grey? What is the access way like? Down a small path or is there room to move in and out freely? You can build up to 20m2 covered roof space so long as it is attached to the existing dwelling otherwise we will work with you to gain council consent. Consider your budget. The purpose for your pergola, its size, its design, and the material used to make it all will have an impact on how much it will cost. Let us know and we can work with you to find a suitable style of protection for your environment. Customised Pergolas are no problem for the ADF-GOLA team. Recently, we have designed and built many custom aluminium ADF Golas. These are perfect for placement over decks and patios, entrance ways, spa pools and more. Talk to us today and let our experienced staff work with you to design a ADF-GOLA to suit your site and specifications. We can build mono pitch or curved designs to suit your needs. offer year-round permanent protection and create another space for you and your family to entertain in. The ADF-GOLA is a great area to get the laundry dry and is a serious selling point for potential home buyers. We keep our knowledge and requirements of the building industry up to date, in order to deliver you the best quality and standard of workmanship. All fixings we use are stainless steel so perfect for our coastal environment. Customised timber Pergolas or Verandahs are no problem for the ADF-GOLA team. We are happy to help come up with a custom shade structure, with unique beams, rafters and stringers to compliment your outdoor living space. Talk to us today and let our experienced staff work with you to design a pergola to suit your site and specifications. We use quality aluminium extrusions to build your ADF Gola. These will not rust. We choose to use local products. For visual impact, you can choose from a range of colours. Create a bright boundary, or use natural stained wood to complement the landscape. Our ADF GOLAS are connected safely to your House Soffit. We fix securely a piece of Dressed Treated Timber to the underside of your Soffit, then attach our custom made Soffit brackets to this. All our ADF GOLA components then fix to these Brackets leaving an open outdoor living space as the only posts needed are the ones on the outside. We use flashings that help keep your ADF Gola as watertight as possible. We use alsynite roofing with a 10-year limited lifetime warranty which has four colours to choose from. We will help you finalise your plans and along the way give you any professional recommendations we may have. ADF not only build ADF Golas, we also repair existing pergolas & verandas. The expert ADF team can provide a top-quality solution that suits your needs. A veranda must comply with the Building Act 2004 and the NZ Building Code. If your new ADF Gola is bigger than 20m2 you will need council consent. We suggest to keep it under to save you cost and time. After all, 20m2 is quite a lot of room to entertain.